I’m sure you have all been wondering, where’s the yurt?! Well, we’re making progress. The biggest issue we have is that we’re working with two different kinds of wool and we’re blending them to try to make the most felty combination. In order to do that we need to do some trials! 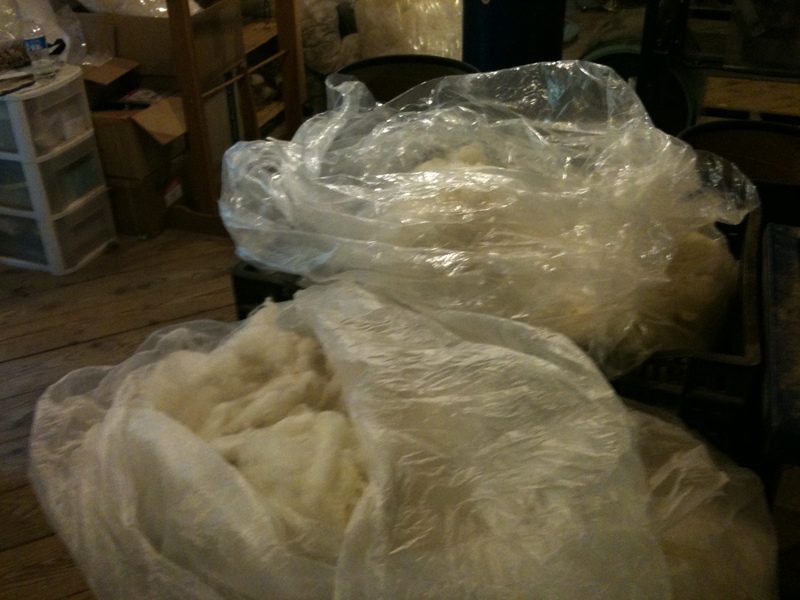 Those are each bags of one kind of wool, either Dorset or Icelandic. As you can see they’re much cleaner than they were a few weeks ago! That’s because Jennifer over at Fiber Dreams in Temple, NH gave them all a good washing. The Icelandic turned out to have quite a bit of lustre to it, it’s very pretty! I really was shocked at how white they all came out. 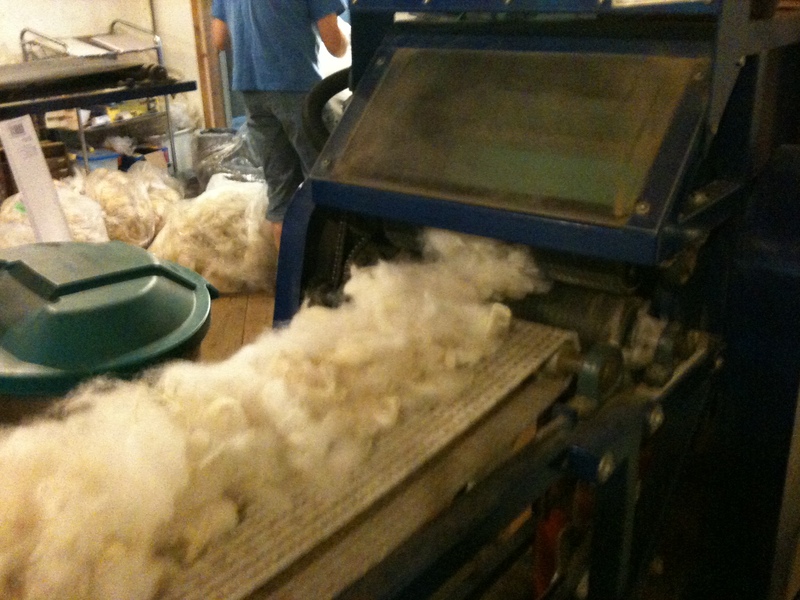 We took that washed wool and laid out some Icelandic and some Dorset on the conveyor belt going into the picker. The picker then got out some more of the vegetative matter and fluffed it all up a lot. 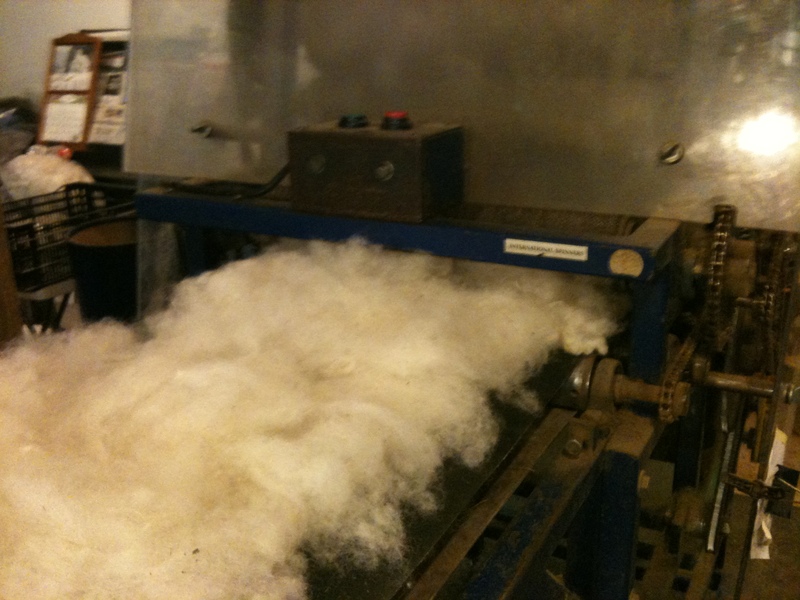 The funniest part about the picker is that it throws the wool into a room behind it that just looks like it has clouds blowing through it! That is wool, post-picker, just laying on the floor after it flew through the air. 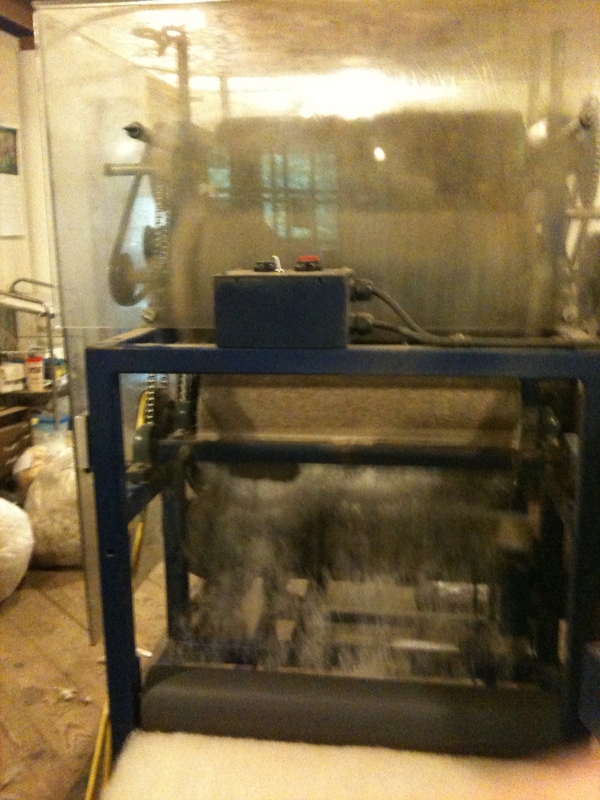 We then sprayed it with water and conditioner so that it was ready for the carder, a huge machine with tons of rollers in it. 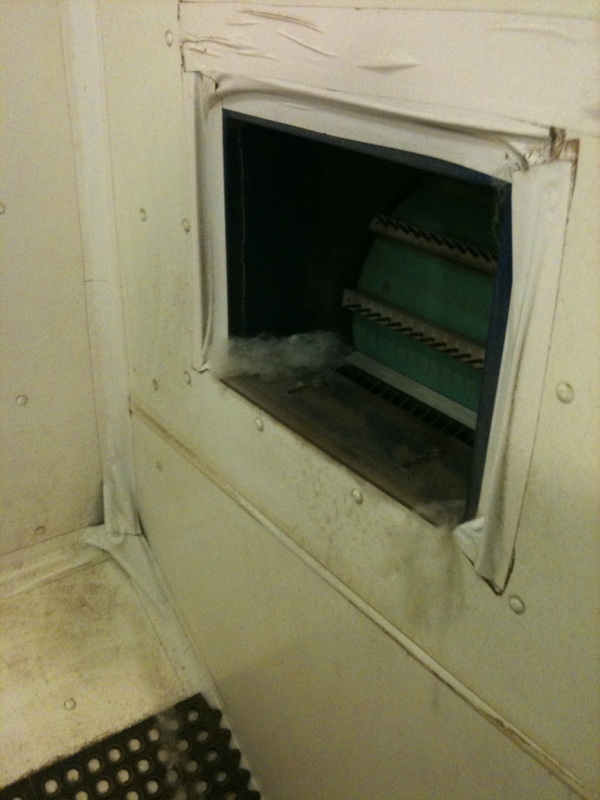 The image above is of the backside of the picker, that’s where the wool flies through into the room. I’m not sure if you can tell but there are some gnarly teeth on that roller! 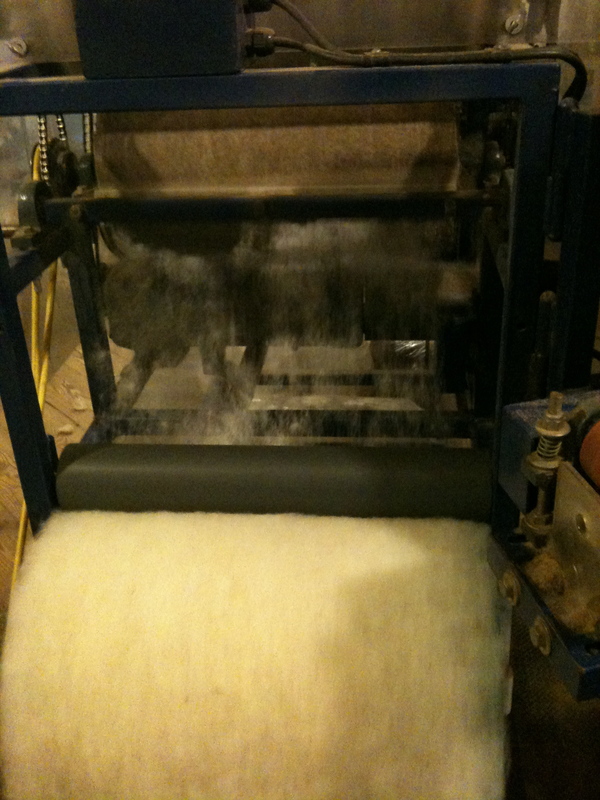 Once the wool was well conditioned we laid it out on the conveyor belt into the carder, which is a slow machine that rolls the wool around in it 16 times and gets out more debris. Once it goes through this process it’s as good as it’s going to get for my purposes. This machine spits out batts onto a roller at the end. 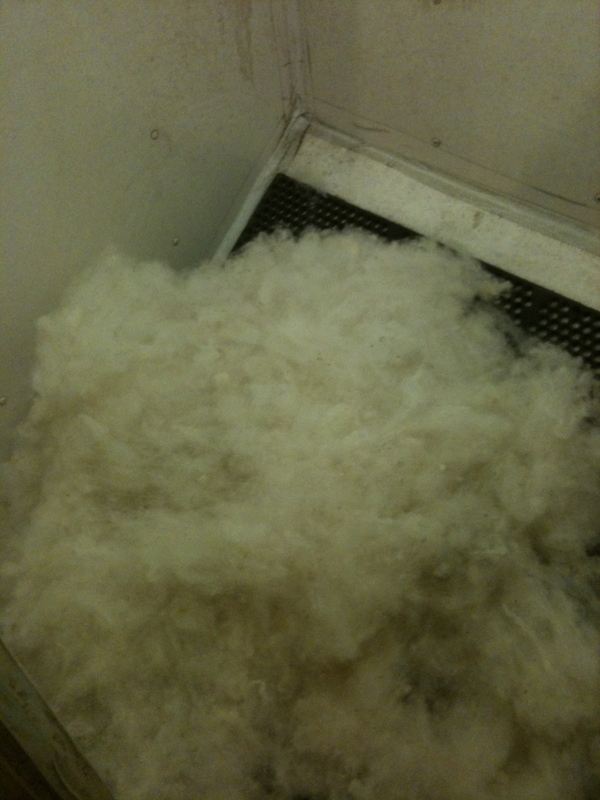 This is the backside of the carder, you can see towards the bottom the thin mesh of wool, that’s how it comes out of the machine and laid onto the batt. The big white ball at the bottom is the batt itself! It’s ready for felting and, though it looks huge, that’s only ONE pound of wool…and I have hundreds. It took Jennifer and I about 90 minutes to measure, pick and card 2 pounds so for this project patience is a virtue! I’m having a bunch of people to NH this weekend and we’re going to play around with which version is feltier. 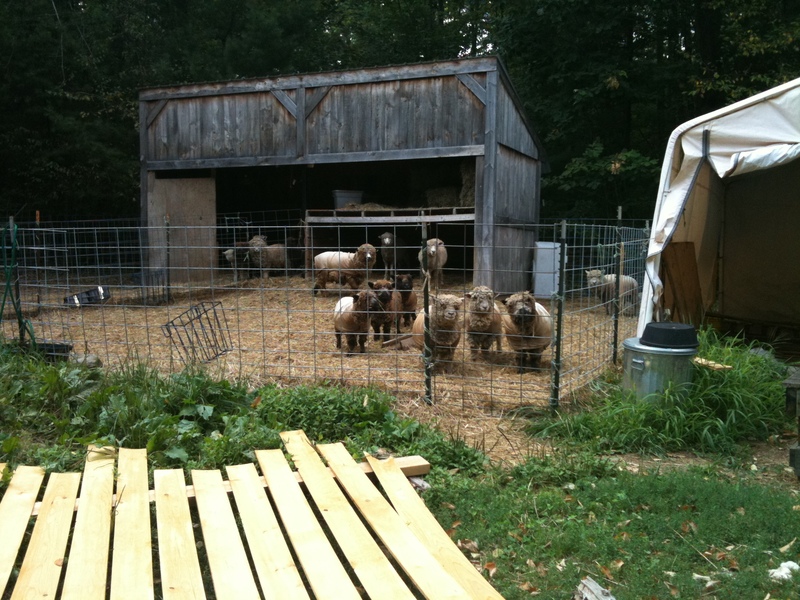 Once we know we’ll have the rest of the wool done with that ratio of Dorset to Icelandic and get going on the yurt! These cuties were standing by watching me leave, bahhing up a storm! So cute I had to take a pic, they are so fluffy in their coats! This entry was posted on Thursday, August 12th, 2010 at 1:40 pm and is filed under Process and Wool. You can feed this entry. You can leave a response, or trackback from your own site.